It’s probably no surprise that I am a backseat, a passenger seat, and every other seat, driver. That’s what happens to us folks who have trust issues that turn into control issues and whatever else kind of issues that I am sure are side dishes to those. I have long been remanded to silence on car trips (in my backseat driving capacity anyway) so my driving instructions, criticisms, and suggestions only occur in my head which leaves not much room for any other kind of thoughts. On our long trips from California to Arizona and back I know the road so well that there is nothing new to discover, and nothing to distract me from the traffic. We have been in every establishment along the lonesome 40 at some time or another, so it has been relegated from road trip to just the trip home. In recent years I have taken to reclining in the back seat and giving up control completely to my able bodied hubby to get us where we’re going. My hobby is looking at the world through the side window which surprisingly is a whole new area of discovery. What I thought was familiar territory is quite different. A Dead Poet Society “aha” if you will. I look at the world anew, and it sometimes reminds me of places I’ve been so long ago that I almost forgot what they looked like, or that I was there at all. For example, the Cajon Pass out of the side window on a rainy day looks like the cliffs of Hawaii, and for a moment I am transported there. The sights, the smells, the sounds of the tropical paradise of my youth. The Mohave desert out of the side window reminds me of car trips (how long has it been since people took Sunday “car trips”?) 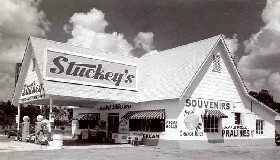 with my mother and grandmother when we would stop at Stuckey’s and get pecan rolls to snack on. For a moment I am transported back in time to the little red Mustang with white upholstery and I can almost hear my Grandmother’s voice again. My little sister asleep by my side, and me dreaming of the day when I would be old enough to sit behind the driver’s seat. Little did I know how lucky I was to not have the responsibilities that come with that age. The side window is a time portal, and I its willing passenger. This entry was posted in Backyard Adventures, On Getting Older, Road Trips, Travel and tagged Baby Boomer, Dear Diary, From the Side View, From the Side Window, Road Trip, Road Trip Musings by ckdenson. Bookmark the permalink.